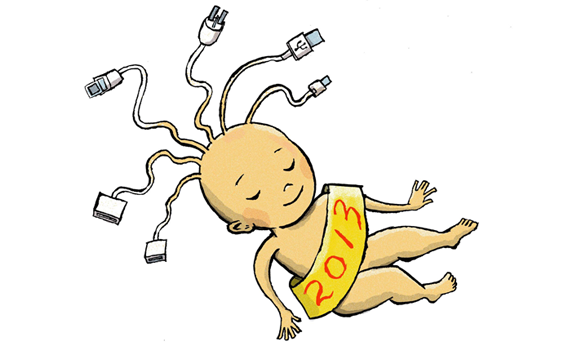 New Year’s resolutions for technology in 2013. Forget Inbox Zero. Get off Twitter. And other resolutions to make my tech life better in 2013. I write about technology for a living, but tech, and the way I use it, frustrates me all the time. I’m constantly finding technology slow or annoying or buggy, and I’m always on the lookout for new ways of doing things. 1. Stop chasing Inbox Zero. I’ve got 91,109 unread messages in my inbox, and I feel fine. Even worse, I have 4,152 messages flagged for follow-up that I haven’t yet gotten around to doing anything about. Do you consider me a slob for letting my email get so messy? Do you have a similarly overgrown inbox and find yourself racked with guilt and anxiety, vowing to turn over a new email leaf in the new year—you want to respond faster, respond more consistently, come up with system that helps you avoid missing important messages? Do you find yourself veering toward declaring email bankruptcy—a public admission to all your friends and colleagues that you’ve given up responding to them? For the New Year, I say forget all that. I’ve tried for years to manage my email. There was a time I chased Inbox Zero—the zen state of having no more messages to read or respond to, and thus, supposedly, feeling a sense of guiltless peace with the world. Once or twice in my life I’ve achieved Inbox Zero. Getting there isn’t easy, but it’s not impossible (here are some of my tips). Maintaining Inbox Zero is harder still, but if you’re diligent and have time to spare, you can probably do it. Beware, though, that we’re all always getting more and more email—so the time you devote to tending to it will always increase. But here’s what I’ve decided: Inbox Zero isn’t worth all that time. It’s a false god. I haven’t seen any evidence that diligently responding to, archiving, or otherwise maintaining one’s email improves life in any way. Sure, you don’t want to fall down on your duties—if responding to your boss is an important part of your job, then of course you should respond to your boss. But if you’re good at your job you’ll do that anyway. What I’m saying is, don’t pursue Inbox Zero for its own sake. A clean inbox is nothing more than a flag on some server somewhere. It doesn’t mean you’ve actually gotten control of your life. Rather than trying to clean my inbox, I’ve slowly grown to accept it how it is. My daily email routine goes something like this: I try to read most messages that come in. I respond to the ones I can immediately. I try to flag other important ones for follow-up. A few times a week, I look through the flagged messages and try to respond. The system isn’t perfect. I don’t respond to everyone I need to. I often respond much later than I should. Sometimes I miss important messages. But here’s the key detail: I don’t let the tardiness bother me. So I’m not good with email; so what? As long as you’re attending to your work and your life, your email habits aren’t ruining you. Indeed, if you practice my carefree email philosophy—let’s call it Inbox Infinity—you’ll discover that most of your email isn’t that important anyway. I’ve found that most people aren’t bothered by late responses. They’ve got messy inboxes too. They know how it is. And if someone really needs to get a hold of you, he’ll email again. He’ll call. He’ll IM you. He’ll tweet. He’ll stop by your house and knock at your door. In 2012, Twitter evolved into something I’ve been looking for forever: The world’s perfect news source. For news junkies like myself, there was no better way to follow breaking events like the Sandy Hook shooting, Hurricane Sandy, or the fiscal cliff meltdown. Even big, months-long stories like the presidential campaign were best filtered through millions of tweets. I found that Twitter not only helped me keep track of what was going on, it also added much-needed perspective around the news. A few years ago I wrote a book in which I worried about the Internet’s capacity to spread rumor and plug us into our own echo chambers. Since then Twitter has become the most powerful force to address those problems. This might surprise you, since Twitter is often criticized as being a disseminator of half-facts—how many times has Morgan Freeman been reported dead on Twitter?—but as BuzzFeed’s John Herrman pointed out in one the year’s smartest blog posts, “Twitter’s capacity to spread false information is more than cancelled out by its savage self-correction.” This is true, too, of echo chambers: If you follow at least a few dozen people, you’ll inevitably find yourself exposed to many ideas that confound your long-held beliefs. Twitter is the anti-filter bubble. OK, so if I love Twitter so much, why am I ditching it? Because it’s sucking up too much of my time. Twitter has become so entrenched in the news business that much of what I see there shows up at other news sources more or less immediately. So you don’t really need to follow Twitter that closely anymore; the stories you’ll find on any good news aggregator, from Techmeme to the Drudge Report to “The Slatest” to Digg, are deeply informed by what’s going on Twitter. More and more, these days, I find myself following Twitter not for news but just as a way to procrastinate. I get pulled away into the minutiae of news, the stuff I’d never have cared about in the past—just now, for instance, I followed, in real time, the vote count for speaker of the House—only because people are talking about it on Twitter. That’s no way to live. Twitter is the world’s most comprehensive news source, but as a result it’s also the least efficient. Your time is better spent doing other things. Or, at least, mine is. 3. Become a better mobile typist. I’m a terrible typist even on the best keyboards, and on touchscreen devices I’m hopeless. I’m slow and make a lot of errors. Sure, lots of people have trouble on touchscreens, but I know many who are ninjas on them. And not just kids. Mark Zuckerberg wrote Facebook’s IPO investor letter—more than 2,000 words—on his iPhone. I don’t want to write a treatise, but I do want to be able to do more than just dash off one-word texts. Right now emails I send from my phone are torturous to compose and full of errors. Surely I can do better. How am I going to improve? Practice, of course. There are lots of typing-trainer apps available for mobile devices. I’m going to pick one up. 4. Use Android more often. One of the best tech developments of the past decade is the decline of Windows as the world’s sole personal computing platform. A dozen years ago I used Windows exclusively. Nowadays most of the software I use on a regular basis works on the Web or many different kinds of devices; this lets me switch between my Windows desktop and my Mac laptop very quickly. But mobile devices are less compatible with one another. Because Apples and Androids rely on different app stores, most people use either one or the other. This causes lock-in: You keep buying iPhones because all your apps are there, even if something else might work better for you. I worry about that happening to me. As a tech journalist I’m always trying out new phones, so I always have an Android device around, but my main personal phone and tablet are made by Apple. This isn’t terrible: Apple makes the world’s best mobile devices. The iPhone and iPad work better for me than their competitors. Still, I’m wary of getting locked in. I don’t want to get stuck on a particular device with a particular way of doing things. I want to keep an open mind. So: Sometime this year I’ll replace my beloved iPhone with an Android phone, and I’ll try to stick with that device for at least six months. I’ll do it for the columns, but I think regular people should think about switching things up, too. You’ll never know what you’re missing—or how good you have it—until you try the alternative. 5. Record more of my life. Ever since I had a kid a couple years ago, I’ve been capturing more and more of my life for posterity. I snap photos and videos of my toddler every day. As a journalist I also capture a lot of my conversations—I take notes and record phone calls and face-to-face interviews. Yet I keep missing stuff. My son has been talking for about six months, and it’s been remarkable to see how his speech has changed over time. One of his first words was cookie, but he’d pronounce it cook-a. Then, over the course of a few months, he began to learn the correct way. Now his original pronunciation of cookie is lost to me; I didn’t record it because I didn’t realize how ephemeral it was, how it would soon become something else, and how I’d forget it. So now it will be gone forever. This year I plan to record a lot more videos. In my ideal scenario I’d set up cameras all over my house and just record everything. There would be a server farm somewhere storing hours of videos of my happy little family. I don’t have the resources of the producers of The Truman Show, but I am going to make an effort to pull out my phone and start recording more everyday stuff. Even if we’re doing something banal and uninteresting—or, especially then—I’ll try to get it on tape. I’ll record dinner. I’ll record bathtime. I’ll record bedtime stories, tantrums, cajoling him into his car seat, everything. Is all this shamefully narcissistic? Is it a pathetic way to guard against the inevitable loss of my kid’s childhood? Sure. But why not? There are few technical limits, anymore, to recording everything. You’ve got enough storage space, you’ve got cameras everywhere. Soon all those videos will become searchable. Forty years from now I’ll be old and bored, and won’t it be a blast to look back in my archive and see what life with my son was like for two minutes on some random Thursday before the robots took over?